Everyone's favorite gossipy grandma and queen of all things plastic surgery, Joan Rivers is once again up to her old tricks... And this time she's taking viewers of her whimsical reality TV show Joan & Melissa: Joan Knows Best into the operating room for yet another cosmetic procedure. 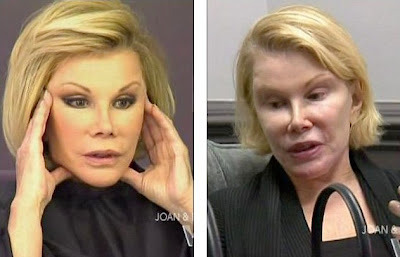 At this point, one might think Ms. Rivers hasn't any untucked flesh remaining, however the procedure 'du jour' was apparently a neck "tune-up", according to Joan. Before being willed off to the operating room, Joan was seen while fully stripped of her usual heavily coated face paint, reveling a makeup-free plain view of her extensively modify mug. Joan Rivers Before Her Latest Plastic Surgery Procedure. Prior to the operation, daughter Melissa expressed displeasure in her mothers cosmetic addiction. Going as far as staging an intervention, and pleading with her to not undergo another procedure, saying "I don't want you to die." But Joan wasn't having any cosmetic compromises. The always quick-witted Rivers' fired off numerous zingers including "My body is a temple, and my temple needs redecorating." Furthermore she explained how she wasn't opting for "a Chaz Bono" just a little nip.